Under the shadow of the migrant crisis that has flooded Europe with wave upon wave of humanity seeking an escape from their misery, poverty and war for a better life; there is talk in Europe of ring fencing off Greece from the Schengen zone aimed at averting the waves of humanity from travelling further north to Germany, Austria, and Northern Europe. Europe thus far has failed at implementing its own plans to share the migrants out in quotas all over Europe, and national interests now override pan-European interests. Once upon a time, the geography of Europe meant that it was far enough away and cut off by the Mediterranean to feel that it was a haven of sorts. Yet the modern world and its technology have shortened the distances and now the geopolitical crisis in the Middle East and Africa are now threatening to engulf Europe and drag it down into chaos. 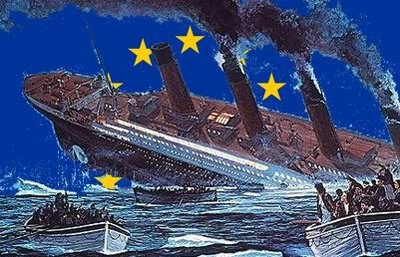 Europe in the past ten years has started to fray and fall apart, the misplaced youthful utopian ideals are now foundering against the rough rocky shore of the reality of the world around it, and of the aspirations of its own people of which the Brussels bureaucratic elite are ignoring. Who are diametrically opposed to the wishes of its own people, and are ruling through a new form of an imperialistic empire by threats and intimidation. Europeans swallowed the lies and utopian myths of the European Union and closer integration, to the hegemonic benefit of Germany, France and northern Europeans. The cajoling and bullying of Greece into a debt bailout that was always going to be unsustainable, where Greek debt to GDP is over 175% was detestable. The reality is that no matter what Greece does, it will never ever pay off its huge mountain of debt, it has become a huge Sisyphean burden of rolling debt payments up the hill, only for the boulder to come rolling down again. Youth unemployment in Greece and other areas in the EU are up to 50% and adult unemployment up to 25%. Children in Greece for the first time since World War Two are now suffering from malnutrition; attending school in a dizzy faint at not having eaten for days. I know of both family and friends that have no heating or electricity and who line up in soup kitchens, former members of the middle class. A particular unnamed niece of mine who is seventeen years of age and lives in the rustic idyllic woodlands of the highlands, has attempted suicide on several occasions. Where even though she and her family live in the most self-sufficient area of Greece, seeks to end her young life before it has even started. I am the only family member that she can speak to and respects and I have been counselling her continuously via Facebook messenger over this last year. After delving into the heart of her issues, confides in me that she feels a profound sense of melancholy; that she sees no hope for herself, for Greece or for Europe. Is this the Europe that the grand illusory vision of a united Europe has brought us to? The irony here is that all the Syrian, Iranian and North Africans have also been sucked into a delusion of a utopian idealized Europe that simply does not exist. Thinking that when they arrive in Europe that the streets are paved in gold, that they will be given money, jobs and houses, and that the European women will be easy to have. On arriving in Europe, they have found that the reality on the ground completely different to their preconceived delusions that these poor fools have swallowed. For Europe has become a dystopia of sorts, a cold place with boiling resentments and interests vying against each other. A Europe which has no solution to the failure of world capitalism and where no amount of belt tightening or casting blame on others will help. Europe is barely able to feed and sustained its own burgeoning population let alone the populace of the Middle East. This utopian illusion of the EU is even more pronounced at present, with nations now shutting their borders and instituting border and passport checks and has rolled out the barbed wire to keep the troubles of the outside world out. The reason why the EU is failing and the Schengen zone now in effect dead is that there has never existed a united European nation for this to work, there has never existed one united homogenous European superstate for these theories to be able to work and function. Europe has and always will be a conglomeration of individual nation states containing many different European races. The Austro-Hungarian Empire was also a multi-ethnic empire composed of different races and religions, just like the EU, yet ultimately it failed and broke up along the natural fault lines of its differing nations. At present in regards to the problem with the refugees, the pan-European plan was to share out these waves of migrants among all the EU states, but this has not been enacted upon as yet and will not. For EU nations are now naturally looking after their own interests and those of their own peoples, and which now leaves the problem on the shoulders of Italy and Greece. Yet in the summer of 2015, Frau Merkel made a magnanimous gesture by announcing that all migrants are welcome and that the doors of Europe are now open, with millions of refugees now waiting in the wings to arrive. Now that the reality of the problem has dawned on Europe, they have now realised that they simply cannot cope to accommodate these numbers of refugees and nor can the diametrically opposed culture and religion of the Middle East ever be compatible with European civilisation; for Europe is a secular society where man is the centre of civilisation, and not a mythical and cruel God. So where does this leave Greece? After opening the doors and throwing out the welcome mat, the Germans and northern/ Central Europeans have now showed their hypocrisy and lack of ethics by now proposing to throw Greece onto the sacrificial pyre like some Iphigenia, and fence Greece off and throw it out of the Schengen zone. So that all those millions of poor refugees will not be able to continue with their migratory journey north to Austria, Germany and Northern Europe and will thereby be stuck in poverty stricken Greece. A nation which has been bullied, cajoled and humiliated into accepting in effect 'surrender terms' and its surrendering of its own autonomy. A nation whose national airspace and waterways are being continuously violated by a fellow NATO member Turkey. Where when Turkey's airspace was violated by a Russian war plane for seven minutes, shoots down a plane from one of the remaining superpowers with the begrudging support of its NATO allies; while a deathly silence pervades at the hypocrisy of Turkey's own violation of Greek airspace. So how does one suppose this makes Greeks feel? The moment that Greece accepted the Euro and membership into the Schengen zone became the moment that was the kiss of death for Greece. From that moment on, Greece became a magnet for the peoples of Africa and the Middle East as a doormat to enter Europe; all these waves of people washing over the profound economic and societal problems affecting Greece. Most economists and academics have been stating since the beginning of the EU that its structure and Euro currency is a massive mistake. This writer has been stating for quite an awhile and in the pages of articles in this magazine that the only way to solve the problems of Europe is that something has to die first before something new can be born. That the EU must die and break up, and nations who want to adopt their own national currencies should, and then a loose trading confederation be formed built on the primacy of the independence of each European nation state. Where in effect we need not more of Europe, but less, much much less of Europe. This however is a bitter truth to be swallowed first before this toxic utopian myth and delusion can be destroyed to enable the construction of something new. Where unless this happens and common sense prevails, the evil dark forces of jingoistic nationalism through the tools of the despised far right will prevail and it will be 1936 revisited all over again. Yet here, the most complicit fools in this slide to a dystopian Dantean circle is the leftist forces of Europe, the kumbaya singing, spineless, near sighted weaklings of the socialist world who cannot see past their own noses to see the truth and encompass it within their doctrines of their own humanity. So what should Greece do now? After experiencing over a century of betrayal, deceit and hypocrisy, Greece needs to default on all of its debts, abandon the Euro and adopt its own national currency to again control the fiscal tools to be able to manage its own economy, leave the EU, leave the NATO alliance and run; run and head for the hills. Turn to Russia and make a grand alliance with them and invite Russian naval bases in the Aegean. This is what Greece needs to do, it needs to start taking extreme radical measures to start selfishly taking care of its own interests and secure its own future; for if it doesn't, it will never be free of its burdens. Greece has been betrayed once before by the jealousy and perfidy of Western Europe during the late Byzantine empire of Greece where the west allowed the Turks to take a foothold in Europe by their attacks on their fellow Christians in the Byzantine world, and have thus set Greece back for four centuries. Who can forget the vile and villainous words and enmity of the Latin crusader Geoffrey De Villehardouin against Greece? As its stands at the moment, Greece is tied the sinking 'Titanic' that is Europe. It must leave and reimagine its relationship to the rest of Europe that suits it. Otherwise it will never escape the Sisyphean nightmare that it finds itself in now, and the hypocrisy and lack of loyalty. Greece must venture out into the world and find its true friends, for only then can it try to live a better and more authentic life with rebellion, passion and freedom. There's a saying, 'every man for himself'; every other EU nation is now starting to take care of its own interests, so why shouldn't Greece? It seems to me that the problem, Nikos, is not so much cultural diversity or multiculturalism, that cultural diversity and multiculturalism perhaps best described by the metaphor of a symphony which needs to be played with wholly different musical instruments, or perhaps by that of a mosaic. The problem is cultural dysfunction. A culture does not have to rely on nationalism to flourish. It can in fact be universal while avoiding the provincial and the campanilistic. To say it with Aristotle, the problem is not “harmonia” but Discordia, that dystopian utopia to which you hint. Take the many European races, and other races from other continents, now living in the United States and Australia which you described only a few days ago. They retain their cultures while assimilating and participating into a larger culture at times dubbed Western Civilization, thus enriching that culture. How did these two nations manage to achieve a modicum of harmonia with so many different nationalities, ethnicities and cultures? By adhering to universal principles and ideals which transcend the rabid nationalistic and the ethnic chauvinistic; ideals and ethical principles as enshrined in a Constitution which pays attention to ideals and not mere “realistic” commercial political transactions redolent of Machiavellism and Hobbes’ Leviathan…and considered all important. Emanuel, while you make some very salient points, you miss the point completely here while detouring to a European multiculturalism that does not simply exist at present(this is not the US or Australia, but the EU), and this discussion is not about multiculturalism, but about existential authenticity. What we are discussing here is the delusional failure of the EU,and the responsibility of Greece like other EU nations in placing it's aims first above pan-European aims, that is it! on another level, is the Islamic monotheistic god compatible with secular European civilization? Or the Abrahamic gods relevant?...no they are not, they are redundant! !! ...nor is Catholicism or Orthodoxy. ..they have sunk to the personal level of choice and after 2'500 years of trial and error, Europe now has it correct.The EU at present has it wrong, less not more of Europe and no compromise on the secularism of our civilization!!! We as Europeans have nothing to excuse ourselves for, we've carried our cross, it seems that many Europeans are cowards and apologists to the obvious facts, and their delusion is the big problem here.